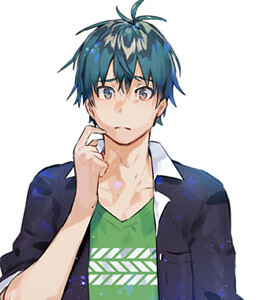 Visual novels Protagonist - Ore-tachi no Sekai wa Owatteiru. His real name is Misaki Reiji but Owari gave him pseudonym Gozen Reiji (written in Kanji that it means "Midnight"). A college student who sometime participate in game development as a part time. For him, Judgement 7 is a special existence. "Oh, it was really delicious. I'm quite impressed ... at how you managed to not use carrots at all."